For years fish has been labeled “brain food” and more recently nutritionists have added “rich in Omega3” and “heart healthy” to the labels. It’s all true! Fish is a good source of protein, selenium, phosphorus, magnesium, vitamin B6, and Omega3 oils. The benefits of eating fish, in particular baked or broiled salmon, three times per week include lowering: the risk of heart disease, blood pressure, macular degeneration, ADHD in children, grumpy teenage syndrome, dementia in seniors, and a whole host of other ailments and diseases. A recent Purdue University study found that nearly 30% of the Americans studied have un-measureable levels of omega3 fatty acids in their systems, placing them at greater risk for heart disease, stroke, diabetes, dementia, behavioral and learning problems. So listen up folks! Adults and children need to eat fish every week. If you think you don’t like fish, start off with fish sticks or fish burgers until you develop a taste for it, then move on to tuna sandwiches, baked and broiled salmon, halibut, and next thing you know the world will be your oyster. This recipe is for canned salmon which is easy on the pocket book as well as tasty. Baking rather than frying further reduces the fat content and ensures even doneness. If you must have a sauce, try non-fat Greek yogurt with tarragon, a dash of Worcestershire sauce and salt. Bake in mini muffin tins for tasty party hors d’oeuvres. Preheat oven to 350° F. Lightly butter 4 mini-tart tins or muffin tins or use the cooking spray of your choice. Combine all ingredients in a bowl. Use your hands and mix just until everything is well combined. Remove cakes from tins, serve with sauce if desired. Hurrican Irene certainly has not affected the avocado harvest this year. For the last 3 weeks we’ve had an abundance of big beautiful avocados for guacamole, salads, burgers, sandwiches, potato causas, fried avocado wedges and just eating right out of the shell with a little lime juice, salt and pepper. I’ve also been pickling pequin chillies and jalapeño peppers which go in my salsas…some with Puerto Rican sofrito. Last winter when the limes were in season I preserved some in salt using an old Fiji Indian recipe and they are really coming in handy for seasoning the avocados. My card partner and I feasted on nachos with this dip on Thursday. I gave some to my neighbors who called it “rico” en español, meaning delish in any language. Its super easy to throw together, then stuff it back into an avocado shell for a simple presentation. Enjoy! Mix all ingredients together just until combined. Try to leave some chunky texture. Next time you need a make-ahead appetizer for a crowd, try these empanadas. With just 5 ingredients you can buy ready-made or make them from scratch yourself, these are a snap to prepare. Fill the empanada sheets the night before your party, then fry them off 20 minutes before the party starts. They only take half a minute on each side. Keep them warm in a 200° F. oven or serve them at room temperature. Offer a picante salsa for dipping…hot, medium or mild. The wrappers are called Plantillas and they are made of masa harina, the same dough used for tamales and corn tortillas. Corn tortillas are not a substitute. The other option is wonton wrappers,West Indian Meat Patties dough or pie dough. Plantillas are available in most supermarkets and Latin/Caribbean markets. The 4-inch rounds (18 per package) make 2 empanadas each. The 8-inch or 10-inch rounds can be quartered. Frying empanadas is quick and they won’t taste greasy if the oil is hot enough before frying. I use an olive oil/sunflower oil product made in Spain. Heat just enough oil to cover the bottom of a non-stick skillet 1/4-inch deep. The oil should not be smoking hot but rather wavy on the surface. You’ll have to watch closely once the frying begins. These empanadas crisp up very fast, less than a minute per side. Chorizo is a Spanish or Mexican sausage full of spices and Spanish paprika or achiote (annato powder) which gives it the reddish color. Choose the chile content you prefer. Some like it HOT! Its essential to render the fat from the meat to mix with the sofrito, black beans and tomato paste. I know your guests will rave about these little pillows of flavor from the Caribbean. Saute chorizo until caramelized and oil has been rendered. Add mashed black beans, sofrito and tomato paste mixed with water. Stir until combined. Set aside to cool. Cut each Plantillas in half if making hors d’oeuvres or leave whole for larger size. Place a spoonful of filling in center of wrapper leaving 1/4-inch space around edges. Fold edges over to make a triangle (or moon for the larger size) and crimp edges together with the tines of a fork. Heat oil in a non-stick skillet until surface is wavy. Place empanadas in hot oil taking care not to crowd them. Fry until crisp, about 30 seconds on each side. Remove to paper towels. You can never have too many salad/salsa dishes in your culinary repertoire. This recipe is from my Jordanian friends in Seattle. 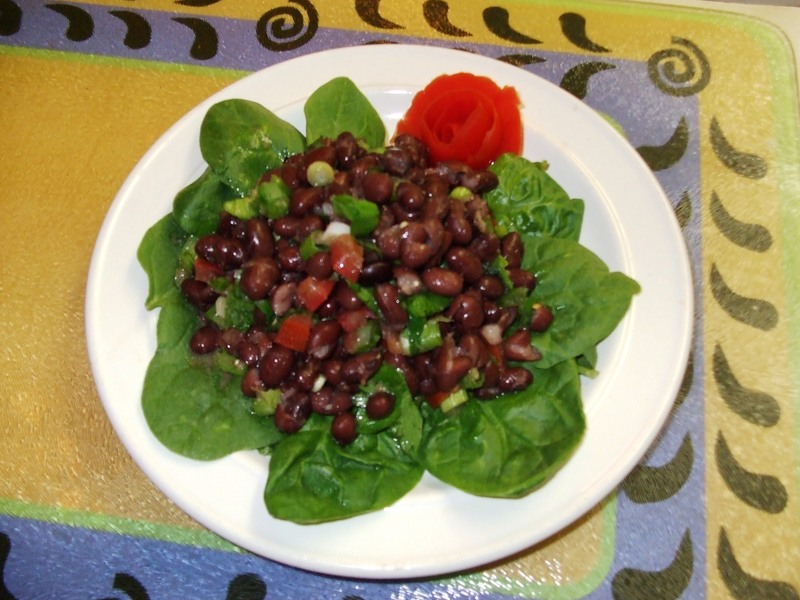 It is a marinated bean salad that just gets better and better the longer it marinates. It has all the essential flavors of the Mediterranean with lemon, olive oil, cumin, cilantro and mint. The addition of chipotle chilies, capers, olives, artichokes or sun-dried tomatoes would give this dish a whole new dimension. Whatever you add to make this your own, it will be well received. Serve it as part of your party hors d’oeuvres in baby hearts of romaine or endive. Or, serve it with tortilla chips like salsa, add it to tacos or enchiladas. Stuff it in hollowed out crusty rolls with deli meats and cheeses like a muffalatta. 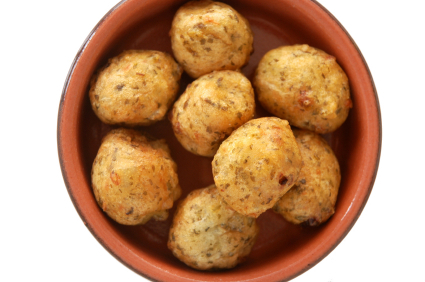 Its a great side dish for a dinner with roasted lamb, chicken or fish. Its also a light accompaniment to a vegetarian sandwich. Rince black beans in a collander. Place in a bowl. Add remaining ingredients and fold to combine. Marinate, covered, in the refrigerator overnight or at least 1 hour before serving in order to develop flavors. 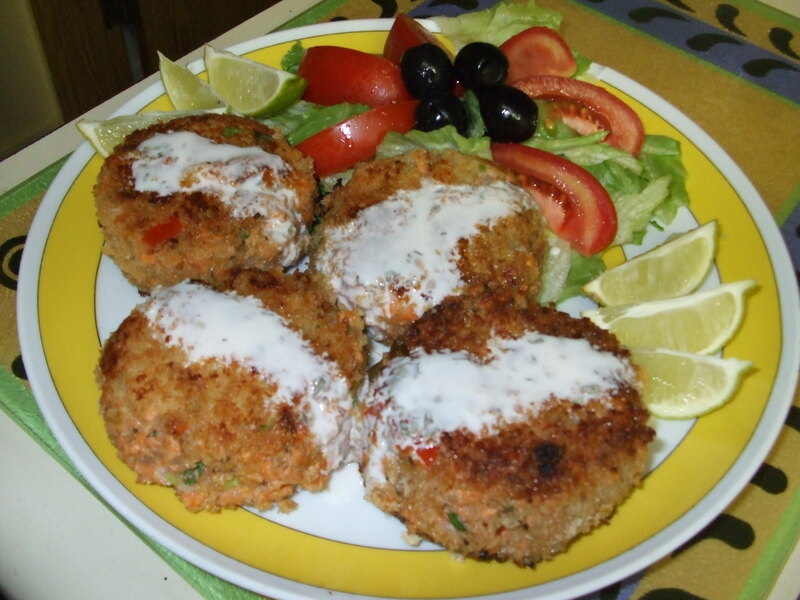 Fish cakes and fritters are very popular in the South Pacific. Tongans usually add yam (ufi) or sweet potato (kumala) to the poached fish. Any kind of fresh fish will do: halibut, whitefish, cod, sole, snapper, or tuna. Tongan homemakers prepare fritters with leftovers from sashimi or coconut cooked fish, and you can buy them fresh made at the local Farmer’s Market (Talamahu). I made lots of potato pancakes from ufi (pronounced oo-fee), a local root of the yam family that grows up to 6 feet in length and is prized among Tongans for gift-giving. At the annual celebration of the King’s birthday, a ceremony is conducted where the village chiefs count the number of ufi presented to the King. The sound off of numbers in Tongan is very loud and dramatic… taaaa ‘ha (one), uuuuu ‘a (two)… ten is an impressive number (hungafu’lo). The King’s palace keeps some of the ufi and the Queen distributes the rest to the villagers, the prison and homes for the disabled. Tonga is one of the last monarchies in the world. It’s located southeast of Fiji in the sub-tropical zone of the South Pacific. It’s also the hub of Polynesia with beautiful tall coconut tanned people. For this recipe you can use American yam or potatoes. Serve with a lemon-aioli, tartar sauce, mango chutney, raita, or fresh chipotle salsa. Simmer the fish with onion, 1 tsp salt, 1/2 tsp pepper, and beer until the fish flakes (about 20 minutes). Drain and flake with a fork. Beat the mashed yam or potato with the half-and-half, remaining salt, and pepper until fluffy. Blend in the flaked fish, roll into 2-inch balls and dust with flour. Deep-fry in hot oil (375° F.) until golden brown. Drain on a rack over paper to catch the drips. Serve warm with parsley garnish and lemon wedges. As soon as the squash and pumpkin plants start blooming begin watching for blossoms that appear nearly closed. Those are male blossoms that have done the deed and propagated the female blossoms. Pick them with a couple inches of stem, wrap them in paper towels and refrigerate until ready to use. They can also be frozen in a single layer on a baking sheet, then placed in a plastic bag and left in the freezer for a winter minestrone soup or a baked side dish. One of my favorite dishes is made with fresh pumpkin blossoms, stuffed with chicken liver paté and poached in chicken stock with butter. I was asked to cater appetizers and desserts for the grand opening of a medical clinic in one of the villages on the main island of Tonga. The King and Prime Minister officiated and were served this stuffed pumpkin blossom appetizer. They sent the server back for refills and compliments to the chef. I was elated! Pumpkin squash is the foremost cash crop of the islands, selling tons of squash pumpkins to Japan yearly. There is so much rejected pumpkin on island rotting in heaps after the boats are loaded that the fly-swarms become unbearable. The Health Minister finally told everyone to bury the rotting heaps and that stopped the swarms of flies. The Tongans feed their pigs with a lot of the rejected pumpkins and they cook pumpkins filled with coconut milk in their umu’s (underground ovens). They also boil and mash pumpkin for babies and the elderly, and grill wedges of pumpkin along side sausages, chicken and lamb chops. Mea’ kai Faka Tonga, my cooking show series on local Tongan TV, had just started so I dedicated one show to pumpkin, demonstrating various ways to use pumpkins in muffins, bread, cookies, pie, stuffed with meat, and stirred fried with other veggies. People were very appreciative and often stopped me in the market or on the street with compliments. It was an enormously satisfying time in my life. 12 male squash blossoms from zucchini, pumpkin, summer squash, acorn, etc. Rinse carefully and trim stems to 1/8 inch from bottom of blossom. Dry on paper towels. Use a pastry bag or demitasse spoon to fill blossoms. Stuff each blossom with pate. In a sauce pan, boil stock and butter until butter melts, reduce heat to medium and poach stuffed blossoms, a few at a time (do not crowd) for 3-4 minutes. Remove with a slotted spoon. Serve warm with garlic toast. Add a few of these little finger foods to the menu for your next spring get-together. They’re quick, easy and tasty. There’s no cooking involved so you can make up platters of these the day before or morning of your party. That gives you time to cook the hot dishes, have a cocktail and relax for a bit. Scandinavian Smorgasbord is the inspiration for this menu. My father was Norwegian so I come by this naturally. However, my mother was French and German and cooked every ethnic dish imaginable, including Scandinavian dishes. She was a “foodie” before the word was invented.